Why Chinatown has Remained Where it is. Has not the time fully arrived when the splendid site occupied by Chinatown should be turned to more progressive purposes? It is pretty safe to say that all conservative, sober-minded citizens would declare that it has. But they would insist that the work should be done decently and in order by law-abiding processes, and without any undue infringement of vested rights; all of which can be easily accomplished, if only the work be taken in hand by the right people in the right way. The trouble with the question of removing Chinatown to a more suitable locality has always been that its proposers have been demagogic politicians of the sand-lot variety. The man, when elected to the Mayoral chair [Isaac Kalloch] by the sandlot elements, issued his proclamation declaring Chinatown to be a nuisance, and requiring its inhabitants to get out with their bag and baggage within thirty days, at the end of which time the place would be destroyed as a menace to the public health. Of course, the labor elements, living for the most part south of Market street, and who rarely, if ever, came into contact with Chinatown, shouted themselves hoarse. The Chief Magistrate of the city had given the word, and it was not for them to question its legality. They were ready at the expirty of the days of grace they avowed, to wade knee deep in blood if necessary to drive the yellow peril into the sea. The police were called in from their beats and housed in the vicinity of the threatened danger; the militia, strongly armed, occupied the armories, and meanwhile the law was invoked which declared the Mayors proclamation to be illegal, and restrained all parties from committing any overt act. The laborers were in earnest, but Kalloch was not. He respectfully bowed to the decision of the courts, and the trouble blew over. The cry that the Chinese must go! was the shibboleth with which the demagogues at that time conjured the working mans vote into the ballot box. It was not the uncleanliness of Chinatown that they were concerned about, but the capacity of the little brown men to work hard, keep sober, live economically, and render their employers a maximum of service for a minimum of wages. To terrorize the Chinese into leaving the country was the purpose of the sandlotters. Our Civic Authorities Recreant to Duty. Naturally enough these experiences for a long time caused every suggestion for the removal of Chinatown to be viewed with suspicion. But the time has fully come when the further development of the city demands that the section in question shall be turned to higher and better purposes. It stands athwart the march of progress. It impedes the citys extension in a very important direction. The residents and property owners of North Beach, and of the very best residential portions of the Western Addition want it out of the way. Above all, business men are ready to buy up the area which Chinatown now covers at a reasonable rate, replace the present rookeries with first-class structures, and make the locality what it ought to be, a thriving, presentable and prosperous center of commercial life. No mans property should be taken from him without due compensation being first made therefor; on the other hand no man should be permitted, out of pure wantonness, to stand in the way of a great and needed improvement. If any such men own property in the objectionable district, the city has abundant power to deal with them if only the law be invoked in the right way. 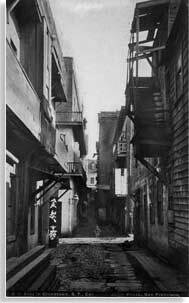 We have no desire to make too much out of the fact that Chinatown is unquestionably reeking with filth and germs of disease, because that is the fault of our civic authorities, who have all the necessary powers to make and keep Chinatown as clean and healthy as any other portion of the city. For more years than we care to recall, there has been politics in keeping the Chinese and their dens in an obnoxious condition. 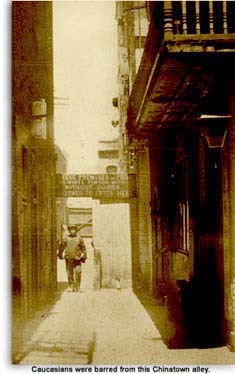 When the plague threatened to reach our shores if it did not actually reach them, as the greatest experts in the land declared it did, it became a supremely important precaution to clean and fumigate Chinatown. The plague had at the time reached as far across the ocean as Honolulu, and was raging in the Chinese quarter of that city. The Chinese had to be removed to a distant camp, and the authorities then thought it necessary to utterly destroy the quarter by fire. Our local Board of Health, with a discretion that it would have been criminal not to have exercised under the circumstances, ordered a thorough cleansing of Chinatown. Our readers know how the Board, for doing its plain duty, was encountered with all possible obstacles and abuse, and how when the sandlotters had elected a fiddler in a theater orchestra Mayor [Eugene Schmitz] of the city he ordered the distinguished physicians who constituted the Board of Health removed from office, and how they are still fighting in the courts to retain their places, with every chance of success. The Chinese Merchants Would be Willing to Move. But the Chinese question is settled now. The labor elements have had their way, and Congress has renewed the Exclusion Act. There is no longer any use in keeping Chinatown as a sort of red herring to trail under the noses of visiting Congressmen. Having served its purposes, be they good or bad, this should be a good time to discuss its removal. A new site being first determined upon, it would remain for the City Fathers to condemn the present one, giving sufficient time to effect removals. Once give the Chinese merchants to understand that a locality has been named for the use of their people, and with their quick eye to detect a good investment, they might be safely trusted to buy up the lands named, and provide buildings such as their countrymen delight to occupy. The Chinese merchants should by no means be lost sight of as an important factor in securing a new Chinatown. If they were taken in hand in good part and in good faith, there is no reason why they should not be induced to come into the project with alacrity. It ought not to be difficult to make them understand that our people are determined to use the site of Chinatown for the betterment and extension of the city, and that better protection can be afforded the Chinese elsewhere. In any event, Chinatown has got to be reclaimed and made a business section of the city. Let us make up our minds to do that, and then a way will be found to accomplish our purpose.